I would like to tell you that every time I teach there are epiphanies all over the room, and that you can hear the angels sing, but that would be lying, so I won’t tell you that. But I will tell you that the closest I’ve ever come to experience such moments is when I let my students find the answers for themselves, and share those insights with each other. Peer-to-peer communication is the most effective teaching tool I’ve ever found, and the most elusive. But what if you could harness it? What if you could bottle it and let your students open the bottle as needed? What if you could- on demand- let students tell other students about the things that they have found and let that be the kindling to a much bigger peer-to-peer fire? That’s what I’ve used YouTube for. In the interest of being perfectly honest from the very start, I am not a big technology expert. I am not even a little technology expert. I barely know how to get by using my computer and my super-smart cell phone. However, I do know a whole bunch of people who are experts in the latest technology, and a lot of those experts happen to be some of the students taking my classes…and the folks at DELTA. This is the story of how I was able to get help from both of those talented groups of people to create a YouTube channel that is being used to teach organic chemistry laboratory concepts at NC State and in some other very interesting places. Three years ago I was teaching one of my organic chemistry lab sections and explaining to my students how to use one of the many instruments in the teaching labs. I was tired of delivering the same explanation for the third time that week (and that was a light week), and mused out loud to my students that I wished there was better way to deliver that content, maybe a way in which they could instruct other students. They rushed to point out to me that –duh- there was a better way, and that –duh- they could help me with that: all I needed was a YouTube tutorial. I –duh- took them up on their “offer” to help me create such a thing, and that is how we got started. The project took shape in a most organic fashion. Since the students were volunteering their time, they empowered themselves with creative freedom, but were nice enough to give me veto powers as far as the content was concerned. Within two days of our initial conversation, a team had been assembled, and a massive social media survey was underway. It turns out that asking a simple question like “what would you like to see in a chemistry lab video” on Facebook can bring you hundreds of responses in minutes. Most of those responses can be distilled into a few principles, which guided our initial efforts: no jokes, no music, keep it short; let the students do the work. A month later we uploaded our first instrumentation tutorial to YouTube, completely scripted, produced, shot, acted, voiced, and close-captioned by students. It was an instant success. We learned a lot from that first experience, and we spent some time assessing the way in which students were using that initial video. We found that there were tangible learning gains when laboratory students were able to watch a tutorial made by their peers (1). We received such positive feedback that we went on to create other tutorials, came up with a name (S.M.A.R.T. Student-Made Audiovisuals Reinforcing Techniques) and I was able to get the attention of DELTA in the form of a large course redesign grant. My association with DELTA took this project from the parochial realm of a few volunteer students to a serious production (with people who actually knew how to do things properly) and our YouTube channel to the next level (with NC State branding and flashy animations). DELTA team members (lead by the formidable Cathi Dunnagan) bought into the idea of this student-generated product and worked hard to preserve that peer-to-peer information distribution model. Together we expanded our YouTube playlist to include a total of 28 videos that span topics ranging from instrumentation to technique to safety, and everything that a student needs to be successful in our organic chemistry labs. We didn’t stop there, but moved on to assessment. In a very original effort, we used 360 spherical video to collect video of lab sections with and without student-generated video supplementation. A review of the lab footage showed that treatment groups invariably completed the lab in less time than the control groups and were, in most cases, less dependent on explanations from their TAs in the subjects covered by the videos. Follow-up survey results show that most students (80% of respondents) found the videos to be valuable aids when completing the lab. (1) JORDAN, J.T., BOX, M.C., EGUREN, K.E., PARKER, T.A., SARALDI-GALLARDO, V.M., WOLFE, M.I., AND M.T. GALLARDO-WILLIAMS. 2016. 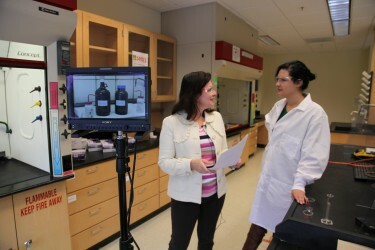 Effectiveness of student-generated video as a teaching tool for an instrumental technique in the organic chemistry laboratory. Journal of Chemical Education. 93(1): 141-145.